Secretary of State John Kerry warned Israel on Saturday about the dangers of the possible collapse of the Palestinian Authority, saying it would lead to a situation that would threaten the security of Israel and the Palestinian people. Kerry told a conference at the Brookings Institution that the Palestinian leadership must do more to prevent and combat anti-Israel violence. But, he also said Israeli leaders should not advocate or allow the Palestinian Authority to disintegrate. If that were to happen, Kerry said, Israel would be forced to assume all governance in the West Bank and potentially accept a one-state solution that would compromise Israel’s future as a democratic, Jewish state. While condemning the recent surge in anti-Israel violence by Palestinians, Kerry said calls from some Israeli politicians to let Palestinian President Mahmoud Abbas’ administration wither are counter-productive and self-defeating for Israel. Without a two-state solution, Kerry said Israel would be forced into an unsustainable position of perpetual occupation that would be rejected not least by the Palestinian but by most, if not all, of the international community. “The one-state solution is no solution is at all for a secure, Jewish, democratic Israel living in peace, it is simply not a viable option,” Kerry said. He also lamented the fact that Israel continues to approve new construction in Jewish settlements in areas that the Palestinians claim as part of a future state, while denying construction permits for Palestinian projects on territory that would be subject to negotiation in an eventual peace deal. “The level of distrust between them has never been more profound,” Kerry said. Kerry urged both Israeli and Palestinian leaders to recommit to the concept of a negotiated two-state solution in order to give both peoples, but particularly the Palestinians, hope that a resolution to the long-running conflict is at least possible. He noted that during a recent trip to Ramallah, Abbas had told him that the level of Palestinian despair about the future was unprecedented. He “spoke more despairingly, my friends, than I have ever heard him, about the sense of hopelessness that the Palestinian people feel,” Kerry said. At the same time, Kerry said the Palestinian leadership must do more to clamp down and end incitement against Israel and Israelis. He cited troubling school textbooks, maps, speeches and media reports that have to be revised. Kerry said both sides need to take urgent steps to renew a dialogue. 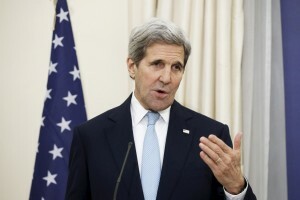 Kerry called U.S. support for a two-state solution the “glue” of Washington’s overall strategy for the Middle East. “It is important that that not become a slogan, not become a throw-away phrase, that it becomes a policy, which is what it is meant to be,” he said. This report was written by Matthew Lee of the Associated Press.